One diner at Sammy's Kitchen says he's only ever seen the house speaker on TV. The Friday before Election Day, I headed to the neighborhoods hugging Midway Airport with one question on my mind: What do the people in Mike Madigan's legislative district think about Governor Bruce Rauner's reelection campaign hinging on the demonization of their representative? For months, Rauner had been campaigning against J.B. Pritzker on the argument that he was the best man to combat the perennial Democratic state house speaker. One ad depicted Pritzker and Madigan joined in an "unholy union" by an officiant who pronounces Illinois "fucked." Another showed Rauner in mom jeans and a leather vest embroidered with a "governor" patch riding a Harley and decrying the "Madigan machine." 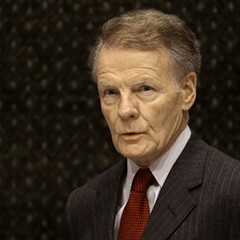 The constant refrain could be summed up in a simple equation: Madigan = greed, corruption, and tax increases. I figured the best place to look for some Madigan constituents would be at the speaker's district office, listed on his website as 6500 S. Pulaski. Driving down the busy commercial thoroughfare past miles of storefronts featuring advertisements mostly in Spanish, I was surprised to find the Balzekas Museum of Lithuanian Culture at this address. I blew right past it at first—there was no indication at all that the drab two-story building doubled as the home base of the longest-serving state house speaker in American history. Upon closer examination of the edifice I noticed a tiny sign to the right of the museum doors, inches above the sidewalk: "13th Ward Democratic Organization Second Floor—North"
On the other side of the door several elderly people were having a leisurely chat with office workers in Spanish. I rang the bell and heard confused shuffling and mumbles through the intercom; they seemed alarmed by the arrival of a reporter. 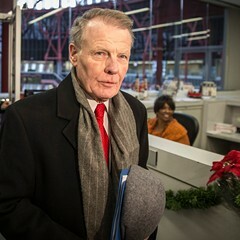 A few minutes later a middle-aged woman cautiously cracked open the door to slide through a piece of paper with the name and number of Madigan's spokesman. She wouldn't let me inside and said she had no idea where Madigan's district office was when I asked if I'd come to the right place. 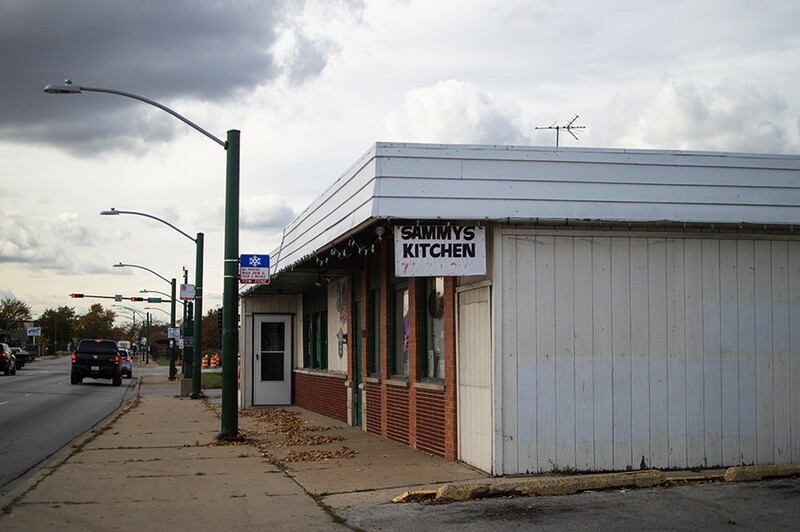 The museum was otherwise deserted, so I headed to a spot called Sammy's Kitchen, right outside the northern walls of Midway. 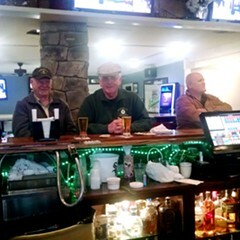 Shift workers and families filled the tiny diner, and at the bar a variety of current and former law enforcement officers offered political analysis. A 74-year-old retired cop named Jerry didn't have a kind word for his state rep, but predicted that Rauner would lose the election. "They didn't give him a chance, Madigan or Cullerton," he said ruefully, referring to the state senate president and the state's second-in-command. He also thought the scandal over the Legionnaires' disease outbreak at the Quincy-based Illinois Veterans Home, which happened on Rauner's watch, would "take his legs off. People don't forget that stuff." While Jerry couldn't explain why people in this neighborhood have been reelecting Madigan every two years since 1970 (he's on the ballot again this year, uncontested), he also admitted he hasn't been very plugged into politics since his retirement. Robert Eigenbauer, a 56-year-old CPD officer still on the job, said people keep voting for Madigan because he's the only choice. A lifelong resident of the area, Eigenbauer said he'd never seen Madigan out and about and wouldn't even know what the representative looked like if he hadn't seen him on TV. "I'm gonna be honest," he said between bites of well-done ground steak slathered in ketchup. "I can't tell you one thing Mike Madigan has done for this community." 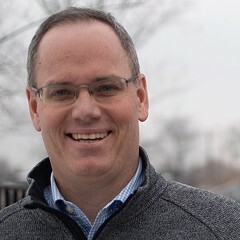 Nevertheless, Eigenbauer wasn't swayed by Rauner's ads, saying the governor's inability to shepherd a budget for the state in a timely manner was proof of his incompetence. I never found anything but the most tepid endorsement of Rauner in the neighborhood—but neither was there much enthusiasm for Pritzker, Madigan, or anyone else on the local ballot. Two years ago the general disaffection with machine politicians and random rich guys running government led to a surge of enthusiasm for Donald Trump's antiestablishment message in this part of town. In 2016, the 13th and 23rd Wards, which make up most of Madigan's 22nd state house district, were among just eight in Chicago where more than a quarter of the ballots cast were for Trump. 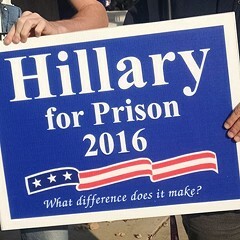 That Election Day, I met David Krupa waving a Trump flag and a "Hillary for Prison" sign outside a polling place at 63rd and Monitor. He described himself as a "day-one Trump supporter," 18, and a fan of the candidate's law-and-order agenda. But last summer, I got a call from Krupa, who admitted that he'd lied to me about his age (because he thought it would be cool to be quoted in the newspaper) and let me know he was now running for 13th Ward alderman against Quinn. I caught up with him at his campaign office on Tuesday, just a couple of blocks east of where he'd been stumping for Trump. 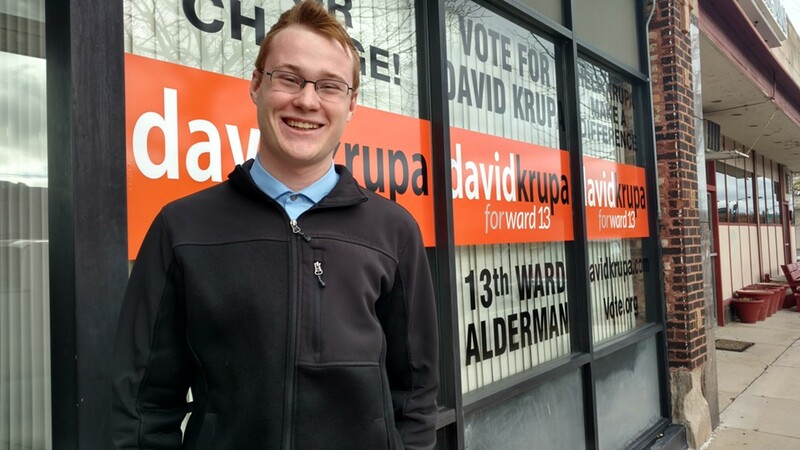 Krupa, now 19 (really) and a student at DePaul, is running as an independent. He thinks that's the only way to beat Madigan on his own turf. He's no longer an avid Trump fan, and traded in his MAGA hat for sensible khakis and a blue button-down. But he's still all about fighting the establishment. He said his youth won't thwart him from being a more transparent and accountable public servant than the incumbent Quinn, whom he described as nothing more than a Madigan "appointee." Krupa is of Polish descent, but he believes he can do a better job tending to the needs of the ward's increasingly Latino population.